While last week ended on a positive note in terms of Europe's handling of its fiscal crisis, Canadians need to focus their concern on the so-called indirect effects from Europe's woes. The reality is that Europe has a very small footprint when it comes to Canadian trade abroad. While last week ended on a positive note in terms of Europe's handling of its fiscal crisis, Canadians will remain concerned about how everything that has happened and could happen will effect things on this side of the pond. 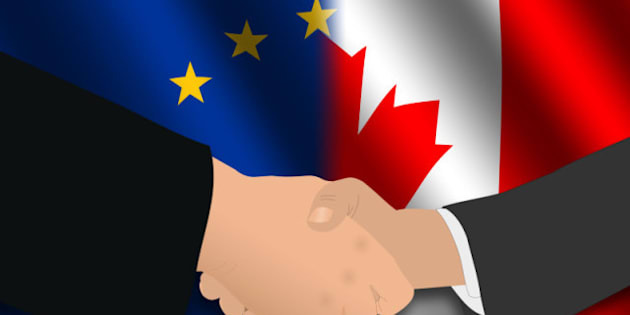 In my discussions with clients and business owners, this concern generally takes the form of the direct effects on Canada's economy, including the business our companies do with Europe and how challenges on that front will impinge on jobs. The reality is that Europe has a very small footprint when it comes to Canadian trade abroad. Using the latest statistics, of the roughly $38 billion in exports only nine per cent find their way to Europe. Contrast that to the 72 per cent share that the U.S. takes in. In fact, Europe has tended to be a net drag on Canadian economic growth, as we have run a trade deficit with the region for years. Assuming Europe falls into even just a mini-recession, that deficit will likely grow over the near-term unless the Canadian dollar experiences a major setback versus the euro (making Canadian companies more competitive in pricing products to that market). Now, these trade figures mask the other direct effects European economic activity has here, since many Canadian companies have sizable operations over there and any negative impact on profits will translate into a poorer bottom line on the consolidated income statement. Still, we're talking dimes next to dollars. Where Canadians need to focus their concern is on the so-called indirect effects from Europe's woes. Let's deal with the easy ones first. If Europe's economy really does slide into a protracted period of low or negative growth, the combined influence on global trade will be more sizable than just what we see in the bilateral numbers with Canada. To the extent that global growth is severely affected, this will also weaken demand for energy and other industrial commodities. For a country like Canada, which has a disproportionate amount of activity in the resource patch, the impact on growth here can be magnified; not only because of volume of trade in commodities, but from the negative effect on prices. This will depend on the movement in the Canadian dollar, but generally speaking, weak global demand and lower commodity prices is a bad thing for Canadian economic growth. The less obvious, but probably more acutely felt, impact stems from what happens to financial markets. To the extent that Europe's credit and equity markets gear down, any investments in that area will be hit. This year, the major European indices are looking at losses of about 15 per cent, compared to about a 10 per cent drop in the TSX and modest gains in NY. On top of that, the balance sheet erosion for European financial institutions will show up in the investments in such institutions made by Canadian banks and investment funds. Investors will see this quite clearly in the valuations of their European-heavy mutual funds or exchange traded funds, but there is a more stealthy risk at play here. Simply put, because the correlations between the world's major stock markets have risen so much in the past couple of decades, it is not necessary to have a large concentration of equity exposure in Europe for that region to have an impact upon your overall portfolio. In other words, we can take preventative steps like reducing risk to that region (which we are doing), but even a zero allocation to European equities can still cause your Canadian stock portfolio to take a knock if things don't get better over there. This inescapable truth only makes it even more imperative to take the steps necessary to control overall risk in the portfolio. Like they say, it's what you don't necessarily see that will hurt you.